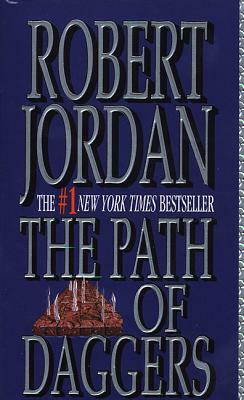 In case you somehow missed it, I'm in the midst of re-reading Robert Jordan's incredible - and incredibly long - Wheel of Time series. I've been listening to them in the car on my commutes to/from work. I'm up to Book 11. I started a year and a half ago. The first time I read this series, I was living in France with no access to television and a limited supply of English-language books (at least until I discovered Shakespeare and Co., but that's another story). As such, Wheel of Time was my daily distraction; on the Metro, on the numerous flights and train rides I took to visit other parts of Europe, for countless hours between classes at the American University of Paris. Despite the distractions of a European setting, I finished all 11 books currently in print at the time in a mere six months. That's approximately 10,000 pages. In hindsight, I couldn't be happier that my first read of the series hit when it did; otherwise, I'm not sure I would have made it through Path of Daggers (Book 8) and Winter's Heart (Book 9). As much as I love Jordan and the impeccable world he has created with this series, Path of Daggers and Winter's Heart, are slooooow. And repetitive. Maybe it struck me more the second time through because it was the second time through. Or maybe it was listening to it (and therefore not being able to skim through the slow parts in a rush to find out what happens next). But if I hear one more time how Nynaeve pulls her braid, or Mat wishes for embroidery, or Rand needs to learn to laugh, I just might scream. The two books could have been consolidated into one, as the bulk of the 900-page volumes strikes me as repetitive descriptive one-liners and set-up for books 10 and 11 (and 12 and 13 and 14, I suppose). Whew. There. That is the one and only time you'll hear me voice a complaint about Jordan. Now that I've got that off my chest, I can turn back to reviewing Crossroads of Twilight (Book 10) and powering through Knife of Dreams (Book 11) with clear conscience. And with any luck, I'll be up through Book 13 before the 14th - and last! - volume is released. That said, if you enjoy epic fantasy novels and haven't read this series: What on EARTH are you waiting for? I just started The Fires of Heaven this morning on the subway and am (as always) excited by the book and discouraged by the length of the book... and I'm not even near halfway through with the series!